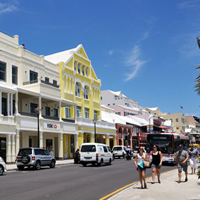 Expats share their experiences with healthcare and expat health insurance in Bermuda. An expat in Bermuda offers tremendous insight into healthcare and health insurance in Bermuda. With one general hospital, King Edward Memorial Hospital, many people are advised to go overseas for surgery and complex issues. Another hospital, Mid Atlantic Wellness Institute, handles mental health and learning disabilities. She discusses prescription mediciness and insurance coverage as well. Get a quote for expat health insurance in Bermuda from our partner, Cigna Global Health. Help others moving to Bermuda by answering a set of questions about health insurance, public healthcare in Bermuda, prescription medicine, quality of medical care and emergency services.